Gathering together to dance in our ancient goddess wisdom in ritual and ceremonies. The Goddess walks through the Earth, flows with the River and rides on the Wind to create the beauty of the landscape that is both in and around us. Come, celebrate the body of the Earth, the physical body of women, and the Goddess that lives and breathes life in each of us. Come, sit in circle with your sisters, attend to your most profound nature, and leave the world as you know it. This year we are having a Celtic Sweat Lodge and other magical rituals and ceremonies. Annette Peard began her spiritual path over 25 years ago, learning body and Indian head massage, metamorphic technique and becoming a Reiki master. She discovered Shamanism sixteen years ago which changed her life. She has completed the Advanced Shamanic Practitioners Course and has attended many shamanic workshops both here in Ireland and abroad, with indigenous shamans. She was made a Peace Elder by Lakota Chief Mary Thunder in 1999 at the Four Directions Conference in Texas. 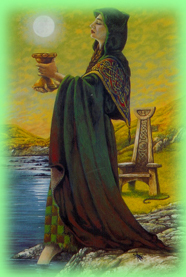 She is also a practising druid and member of the Conradh Draoithe na hEireann (the Convocation of Druids in Ireland). For the last nine years she has also been practising shamanic healing and is available for one to one sessions.